to the voice of your community. Voice is the most universal and inclusive means of communication, and it's an ideal way to expand the reach and impact of health and humanitarian technologies. 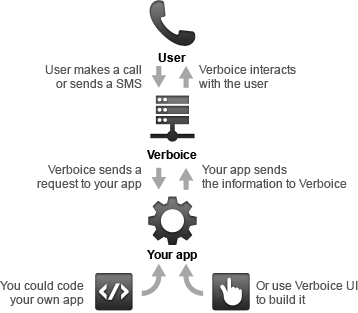 Verboice is a free and open-source tool that makes it easy for anyone to create and run projects that interact via voice, allowing your users to listen and record messages in their own language and dialect or answer questions with a phone keypad. Verboice projects can start small and scale up, making it possible to improve lives even in communities previously closed off by literacy and technological barriers. There's no better authority on the state of human rights in a community than community members themselves. Verboice allows human rights investigators to survey anonymous callers and get an accurate picture of the ground-level conditions in a community. When abuses are noted, human rights organizations can use Verboice to point the way toward supportive/protective resources, supply legal information, and give the most oppressed a voice that carries beyond the confines of their communities. Integrates easily with your existing projects using industry standards. To get started, first set up a phone number dedicated to Verboice. Next, record outgoing messages offline, for later upload, or directly, using the Verboice Web application. Once you've recorded your outgoing messages, create your program's navigation sequence using Verboice's easy-to-use tools and review it using the onscreen flowchart. Community members can then access your interactive program from any phone. The caller will hear your audio file, which will usually ask them a question, respond either by voice or keypad entry and then hear the next audio file that you’ve specified to play based on the caller’s response to the previous question. Responses are collected automatically, and you can log into your Verboice account to review them at your convenience. InSTEDD designed, developed, and pilot tested a tool (Watchfire) to help the American Red Cross (ARC) improve their community- level disaster response in the San Francisco Bay Area. After working closely with the ARC on a needs assessment, we learned that their highest priority was improving the speed and coordination of ARC's Disaster Action Teams (DATs). Watchfire makes phone calls and sends SMS text messages to volunteers to ask them if they can respond to an emergency and provides these potential responders with sufficient information to arrive at the event site. Got suggestions or feature requests? Join the discussion. Got a way with code? Help us develop our tools (and make the world a better place at the same time).